The postal service’s latest warning sent its shares well below its 2013 IPO price. Royal Mail is yet to cut its dividend and has minimal debt, but its main earnings generator is in decline. The risk of a lose-lose scenario involving some kind of UK state support has increased. 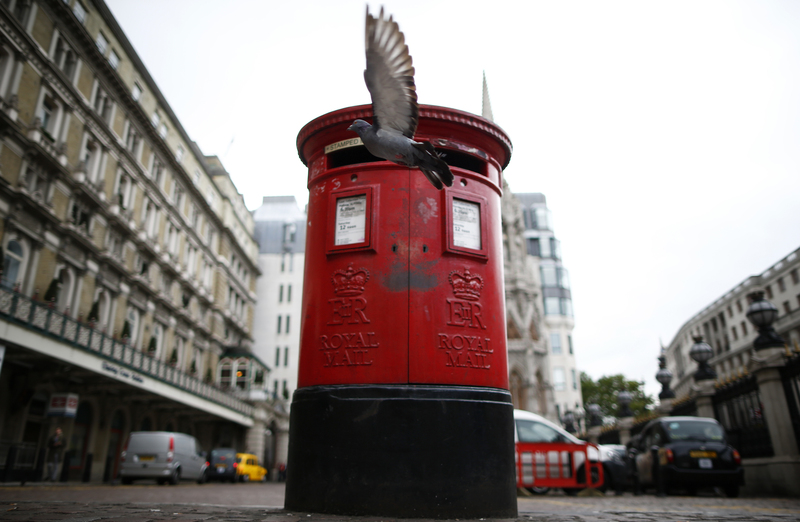 A pigeon flies past a Royal Mail post box outside Charing Cross station in central London, October 8, 2013. Royal Mail narrowed its full-year profit forecast on Jan. 29 and guided to a larger-than-expected decline in addressed letter volumes. The former British postal monopoly said it expected adjusted operating profit before transformation costs to range between 500 million pounds and 530 million pounds for the year ending March 31, below its previous forecast of 500 million pounds to 550 million pounds. It had reported an adjusted operating profit before costs of 694 million pounds a year earlier. The company said the decline in addressed letter volumes, excluding political parties’ election mailings, would likely be wider than its forecast range of 4 to 6 percent in 2019-20. It expects addressed letter volumes to fall 7 to 8 percent for the current year and said the volumes were likely to be outside its forecast medium-term range next year. Royal Mail shares were down 8.08 percent at 276.3 pence by 0845 GMT on Jan. 29.